The CoWatch is a smartwatch perhaps best known as the Alexa watch. That's because it was the first to bring Amazon's virtual assistant to the wrist, before the Omate Rise and the Martian/Guess Connect smartwatches joined the Alexa party. This means you can use voice commands to take control of your smart home and more. IMCO, the startup who made the smartwatch a reality, raised just shy of $300,000 through crowdfunding in 2016 to make the CoWatch, and picked the same Android-based Cronologics OS used in the Blocks modular smartwatch to run the software show. That's the operating system developed by ex-Googlers that was snapped up by Google last year to integrate into its own Android Wear smartwatch platform. Alexa aside, the sub-$300 smartwatch has an impressive specs sheet including a heart rate monitor, IFTTT support, Android and iOS compatibility along with standard smartwatch features like notification support and the ability to make and take calls. So does the CoWatch deliver the goods? We've been living with it to find out if it makes a good alternative to what Apple, Samsung, Google and the rest currently have on offer. If you want a CoWatch, you've got your pick of either a carbon black ($299) or mineral silver ($279) model. Both have 42mm round watch bodies, a stainless steel casing and a ceramic ring surrounding the touchscreen display that you can personalise. On paper, it has all the makings of an attractive smartwatch, but in reality it's another smartwatch that falls into that trap of feeling more 'tech product' than 'good-looking watch'. Yes, the materials are certainly high grade and while the industrial design approach might appeal to some, it didn't quite do it for us and doesn't stand out from the crowd. At 12mm thick and weighing in at just over 50g, it's comparable to the Apple Watch in terms of size and stature, but it lacks the polished svelteness of the Apple Watch or the best that Google and Samsung currently have to offer. The good news is that it's not a hulking beast and is pretty comfortable to wear during the day and at night. The IP67 water resistance certification means it's splash proof as well, just don't take it in the water for a swim. The only thing breaking up an otherwise minimalist look is a single physical button. That'll turn on the display, launch Alexa in a similar way way that Google Assistant can be summoned on Android Wear 2.0 watches, and turn the watch off completely. Around the back is one of the most surprising additions and that's the heart rate monitor. We say surprising, because aside from taking on the spot readings, which were pretty accurate in comparison to a chest strap, there's no other fitness or sports tracking support to really make good use of it. Keeping the watch on your wrist are 22mm straps that are at least interchangeable. The metal band that comes with it reminds us a lot of the Apple Watch milanese watch strap, which is a good thing. The not so good part is the fiddly clasp mechanism. It's really tricky getting it locked in place at times and has actually come loose on more than a few occasions. In the screen department, the good news is that there's a fully round watch face with no ugly black tyre in sight. It's a reasonably sized 1.39-inch, 400 x 400 AMOLED with a 286ppi pixel density. There's apparently a fracture-resistant display to help withstand some rough and tumble as well and we've not had any damage crop up on that screen during our time with it. It's a good smartwatch screen, but it's certainly not the best we've come across. It's well suited for what is essentially a pretty simplistic operating system, but it's not the most vibrant or the brightest, even when you turn screen brightness up to the max. So this is really the big talking point for the CoWatch. It's running on Cronologics OS, an Android-based operating system that has been developed by Google and Android veterans. So it's no real surprise that things do feel a bit Android Wear here. It works with both Android phones and iPhones although it's a more hassle-free experience paired with an Android phone – at least that's what we've found. There's a dual-core processor and 1GB of RAM to power performance but it's far from zippy, and noticeably laggy when swiping through the containers and launching menus. At its core, the Cronologics OS approach is to give users as much information from the watch face as possible to save you navigating around elsewhere to look for it. That's largely achieved by the use of 'containers', which are small circular folders where you can drop in widgets to help you quickly launch the features you use most often. So that could be music player controls, calendar appointments or Alexa. There are three sets of containers and as you swipe through them, the watch face remains in place. Now we know that both Apple and Google's Android Wear takes a similar approach with their complications, so it's not a groundbreaking concept, but the idea that the time-telling features of the CoWatch remain at the heart of this smartwatch makes for an intuitive experience in many ways, and the result is an OS that's easy to get to grips with. Speaking of watch faces, pressing down on the screen takes you into a nice selection of analogue and digital-style watch faces that form the background to those containers. There's nothing in the way of customising how they look and with no dedicated store to download more, you better hope you find something here that you like. The CoWatch will of course offer up that smartwatch staple of dishing out the notifications from your phone to your watch. They can be viewed by swiping down from the main watch screen, where you can view native and third-party app notifications. When they pop up you'll get a vibrating buzz (you can turn this off) and you'll be able to reply, dismiss or snooze notifications. For some apps like Twitter, responding will still require you to head back to your phone. With a built-in speaker and microphone on board as well, you can make and take calls from the watch – though we remain unconvinced that this is a feature that's really necessary on a smartwatch. But it works well once you've hit the phone icon, scrolled through and selected a contact. It doesn't offer crisp call quality, but if you want to take calls, CoWatch can make it happen. When it comes to apps, you're not going to get Google Play or App Store levels of love here. In fact, there's no dedicated store at all. Instead there's a bunch of native apps you can view by swiping up on the main screen, and you'll see apps for counting steps, checking in on the weather, setting alarms, viewing your calendar and setting up timers and stopwatches. There's nothing really out of the ordinary here that you wouldn't find on most smartwatches. 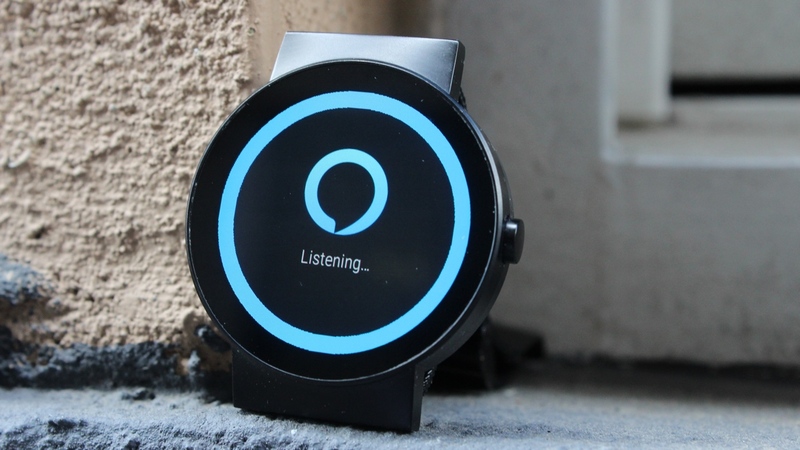 The CoWatch's party piece is the compatibility with Amazon's virtual assistant, Alexa. To get things up and running and working correctly, you need to first download the Amazon Alexa smartphone app and make sure you pair your watch with your account. You'll also need to edit settings like device location, measurement units and time zone to make sure you get the most relevant responses, and link up other services like calendars, purchases and smart home devices to get the most from of it. On the whole, it works well. The built-in microphone is reliable in picking up what you say and it works just like Amazon's Echo speaker. Ask it about sports results, the weather or a joke and it works. Unfortunately things are a bit buggy. The watch appears to lose connection regularly, prompting you to tether or reconnect to Wi-Fi despite having used the feature just moments before. It makes the Alexa integration useful but also frustrating when it doesn't want to play nice. For a secondary hit of smart home support there's also IFTTT integration on board. That'll let you create recipes assigning containers to launch smart home lights in your living room, automatically make a phone call to yourself to get out of an awkward situation or just let your partner know you're on your way home. The problem is that it works too inconsistently right now, which is a shame because it actually shows as much promise as the Alexa support. Something you're not going to get from the CoWatch is great battery life. IMCO claims you can get up to 32 hours from the 300mAh battery on board, which in reality is closer to just a day. More than that really is a push. The always-on screen, which is dimmed when you're not interacting with the watch, undoubtedly has an impact on battery performance and there's no battery saver mode to come to the rescue when you want to get some extra time out of it. If you decide to turn the display off then you're likely to get closer to a couple of days, and you can add a battery status widget to one of the dedicated container spots to keep a closer eye on it. To charge, there's a disc-shaped cradle with magnetic pins that clip into the back of the watch. The problem is that it doesn't always successfully click into place, which can make powering back up a bit of a nuisance at times. Charging from 0–100% takes a couple of hours, so there's nothing out of the normal here as far getting it powered up again. While the CoWatch does bring some interesting ideas to the smartwatch table and shows plenty of potential, ultimately it doesn't mask the niggling issues that make it frustrating to use at times. Yes, the Alexa integration is a nice addition as is the IFTTT support, but it's temperamental and the laggy performance doesn't help matters either. If you really want an Alexa-friendly smartwatch, we're sure there'll be another watch that'll do a much better job of building in the virtual assistant. The CoWatch does the smartwatch basics well, but if you are looking for more from those software extras, you're going to feel let down.